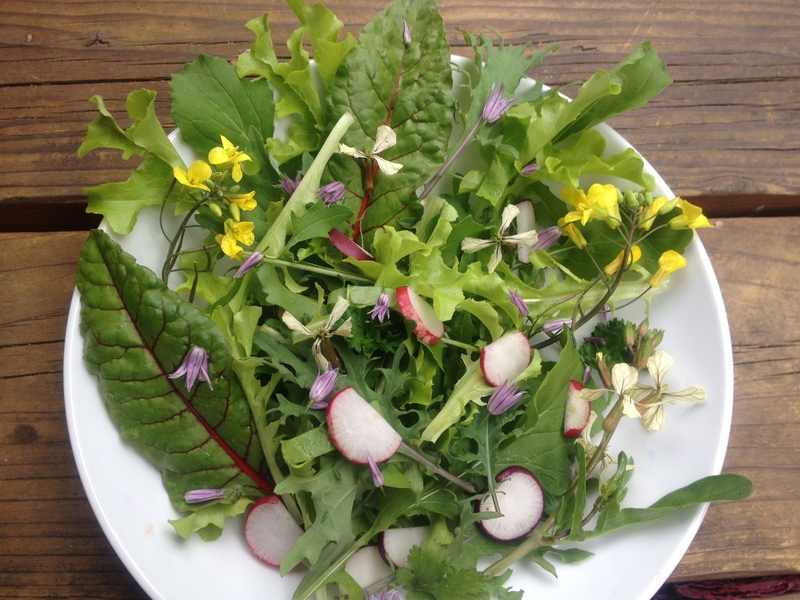 Springtime Garden Salad: Pick or purchase some tender greens. Consider adding thin slices of radish or even baby zucchini if you are lucky enough to live somewhere much warmer than Seattle. Top with a big handful of soft herbs and edible flowers. Make a vinaigrette with 1 Tbsp. white wine vinegar, 2 Tbsp. olive oil, and a few blades of finely-snipped chives. Lightly dress the greens, turning them gently. (Insert audible gasp here) This is beautiful! Oh my, that looks just amazing. I hate what passes for “spring salad” in restaurants too. Usually it’s just been pulled out of a bag and some of the leaves are mushy and decomposed by the time they plate it. So bad! But this is the pure essence of spring. Such a stunning composition too. Goes to show that nothing beats greens straight from the garden. I love how you threw in the kale and arugula flowers. So pretty! ooooh that looks good. I love to eat arugula flowers–first tried them last summer and suddenly I was tossing them into everything! we’re still some weeks off from them here in the Northeast (at least my corner of it), if you can imagine that…though it was suddenly 95 degrees in the shade yesterday, so the whole edible landscape may have transformed overnight! Yes: “The ubiquitous “garden salad” on restaurant menus. You know the one: wilted (if not decaying) “spring mix,” a few grated carrots, hard cherry tomatoes.” What is so hard about creating a beautiful salad?? No imagination…thank goodness for food bloggers! This is lovely! I am pinning it! I’m re-reading the UNCOOK book. Juliano puts edible flowers on everything. I don’t even know where you find such things if you don’t have a garden! Lovely.